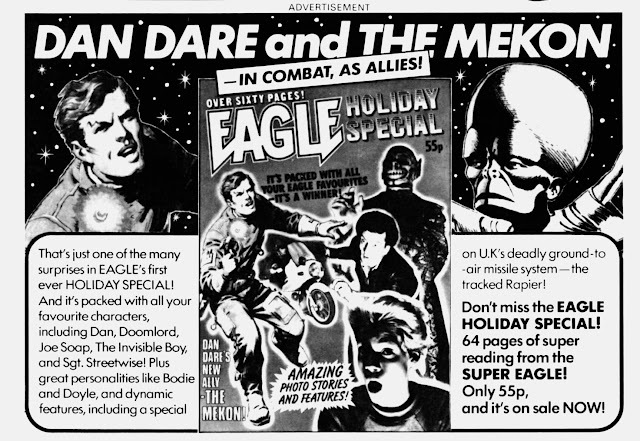 STARLOGGED - GEEK MEDIA AGAIN: 1983: IPC ADVERT FOR THE FIRST EAGLE HOLIDAY SPECIAL. 1983: IPC ADVERT FOR THE FIRST EAGLE HOLIDAY SPECIAL. From April 1983: a House Ad for the very first EAGLE HOLIDAY SPECIAL of the new era. IPC's specials always went on sale much earlier than summer 'proper' so they were always a marker that the long summer break was approaching. I'm not sure whether they were simply trying to maximise their shelf life, coincide with a late Easter or just hit the two May Bank Holidays. Marvel's summer specials always seemed to hit much later... more closely timed to the start of the school holidays themselves. The special itself was very much modeled on the format and formula of the weekly during its first eighteen months... a mixture of original photo strips, traditional comic strips and features.